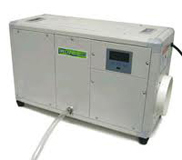 Dri Eaz Dehumidifiers are manufactured by Dri-Eaz Products, Inc. whose head office is in Burlington, Washington, USA. In addition the company manufactures a broad range of other equipment, including airmovers, structural drying systems and air scrubbers, used by water damage restoration professionals and in industrial drying, cleaning, and maintenance work. The business was established in 1980 and its early products were commercial air movers and building dryers. Its focus is on water damage restoration and improvement products and it was a natural progression to introduce a family of dehumidifiers to the broader range. Dri Eaz dehumidifiers are now widely used by water damage restoration specialists in the US, Europe and other parts of The World and are highly regarded by those who use them and, in turn, their customers. The DrizAir 1200 is less capable and sophisticated than some other Dri Eaz products but is a well made and dependable unit for use in smaller water damage restoration projects. The 1200 is compact and light-weight, can be carried in a small truck and is suitable for one person operation. It is also designed for stacking in two layers to make optimal use of valuable storage space at your operating base. The roto-molded housing protects your investment but also reduces the risk of damage to your clients' property, which is good for customer relations and your pocket book! This Dri Eaz dehumidifier comes with a 12 month warranty, including parts and labor, and a six year warranty on the main refrigeration components, including the compressor. The Evolution LGR is designed for water damage restoration projects of small to medium size. This unit is rated for a water extraction rate of 70 pints per day at the AHAM standard but for restoration specialists its rate of 120 pints at near saturation is equally relevant. The Evolution incorporates all the essential features for its heavy duty task and is suitable for other commercial applications including structural drying and construction. Users generally like the Evolution which combines power and effectiveness with rugged construction, light weight, compact dimensions and ease of use. The LGR2800i is a "state of the art" unit for use in the demanding application of restoration work. Its uses Low Grain Refrigerant technology which enables this unit to remove a larger amount of water from the air in conditions of low relative humidity. This capability is a huge advantage on projects where very dry conditions must be achieved. The LGR2800i is designed for larger scale projects and is capable of removing 130 pints per day at AHAM and as much as 200 pints per day at 90°F and 90%RH. This unit is effective across a vast temperature range. This extends to a high of 125°F while its hot gas bypass defrost system allows the unit to retain its effectiveness down to 33°F. Sophisticated monitoring and management systems are built into the LGR2800i which help to improve your bottom line by enabling precise control of costs. The LGR3500i is a more powerful development of the 2800i (see above). It offers all the advantages of the 2800i but provides an increased water extraction rate of 170 pints per day at the AHAM standard and 240 pints at saturation. With the 3500i large restoration projects may be completed in less time which means a larger number of projects can be undertaken; the benefits are obvious. An example of the sophistication of this unit is its automatic fan speed operation which ensures that the air flow is always matched to ambient temperature and humidity to provide the most effective and profitable drying effect. The CMC100 is a commercial unit but can also be used in your basement or crawl space. It has water removal capacity of 70 pints per day and is one of the few alternatives to the Santa Fe Compact. Like the Santa Fe Compact the CMC100 is a low temperature unit that can work effectively in your crawl space even if you live in one of the cooler parts of the country. The main advantages of the CMC100 are its strong construction and flexible installation options which make it attractive if your crawl space is very cramped. Commercial operators may find the small size of the unit and the range of installation possibilities helpful where a discreet installation is needed, in a public area of the business for example, or where space is tight. Those of you who prefer products made in the USA need to know that, unlike most Dri Eaz dehumidifiers, the CMC100 is not manufactured in America. DrizAir 2400 - Click here for more infromation. DriTec Pro150 - Click here for more information.